Cait's Cozy Corner : 4 Easy Tips To Dash Out The Door! 4 Easy Tips To Dash Out The Door! Mornings are never easy for my family. For me, I love getting up in the morning, making a cup of coffee and starting my day writing out a to do list. For my husband, he'd rather sleep as late as he can, enjoy a cup of coffee that I so sweetly leave out for him and take his morning slow. My toddler is so-so at waking up for school depending on which side of the bed she wakes up on (toddlerhood, right!). To make it easy for my family members to get out the door as quickly and efficiently as possible, I began to think of easy tips to help us out in the morning. 1. Set multiple alarms- I've had a problem where I've slept through my alarm and was late to work. Zach and I both have alarms that are 15 minutes apart just in case if we don't hear mine go off, we know that we have a back up. I can't tell you how many times his alarm has helped me to get up and get going! 2. Lay Outfits Out The Night Before- If there is one thing I hate it's trying to pick my outfit out while I'm half asleep. Already having something chosen, I'm able to grab it and go (and the same goes for my toddler!) She's able to get herself dressed and ready to come downstairs because she knows what to put on instead of throwing half her clothes on the floor looking for that favorite shirt. 3. Keep Breakfast Simple- Although Lily will occasionally get breakfast at school, she's always starving for something when she wakes up. Normally we give her a snack in the car and thankfully LALA® Yogurt Smoothies in Strawberry are something we both can enjoy while getting to destination. Lily loves enjoying her yogurt because she actually can drink this smoothie and I can feel good knowing she's starting her morning off with a healthy snack because it's made from real fruit and has 5 grams of protein in it! Plus it's great for enjoying as a snack at the park, running errands or to enjoy after a long nap. I like to pair mine with nuts, for even more protein! 4. Divide and Conquer- While I make my husband his morning coffee and get lunches ready for all of us, he's upstairs helping Lily wake up/putting her outfit on and coming downstairs. It's such a huge help for me to have an extra set of hands in the morning. LALA® Yogurt Smoothies are not just great for your children but also for you and your friends! Personally, I drink these year round to keep myself energized, feeling great and love I can always grab them on the go! 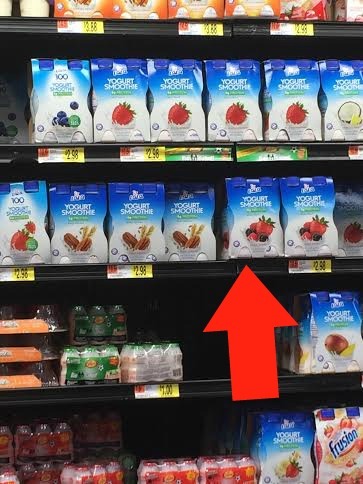 I found LALA® Yogurt Smoothies at my local Walmart. They even come in other amazing flavors such as Pecan Cereal, Coconut, and Pina Colada. Grab your favorites today and get your family out the door with these delicious smoothies! And don’t forget, you can earn cash back by using Ibotta! What are some easy tips for you to get out the door? Ohh gosh my son would love those drinks!!! He'd probably want so many that they become no longer a "healthy" alternative. lol. But what a great get out the door option!! We always lay our outfits out the night before. It really helps SO much! Those smoothie drinks look awesome! I will be on the look out for them next time we are at the store! Laying outfits out the night before is so helpful!! And amen to simple breakfasts!